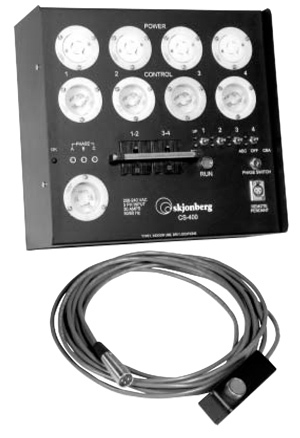 The CS-400 is a local run only controller. This is designed for the user who never plans to grow beyond 4 channels. The hoist select and run capability are on the relay control box, eliminating the need to purchase a remote handset and multicable. A run button on a 25 ft cord is included for convenient running. Power distribution and relay control for the hoists are supplied. The basic design runs 3 phase motors at 208V-220V. A 30 amp Hubbell Twistlock input provides adequate current to run 4 lhp motors. Each circuit breaker protects 2 motors. The CS-400S is available to run most single phase motors. CS-400 WITH RUN SWITCH ON CABLE. LOCAL RUN ONLY. ROAD CASE IS OPTIONAL.